Last week, I received an email from Eerdmans Books for Children with some reviews of ‘Manger’, a book I illustrated for them in 2014 – there’s definitely no guarantee your publisher will send reviews out on time! 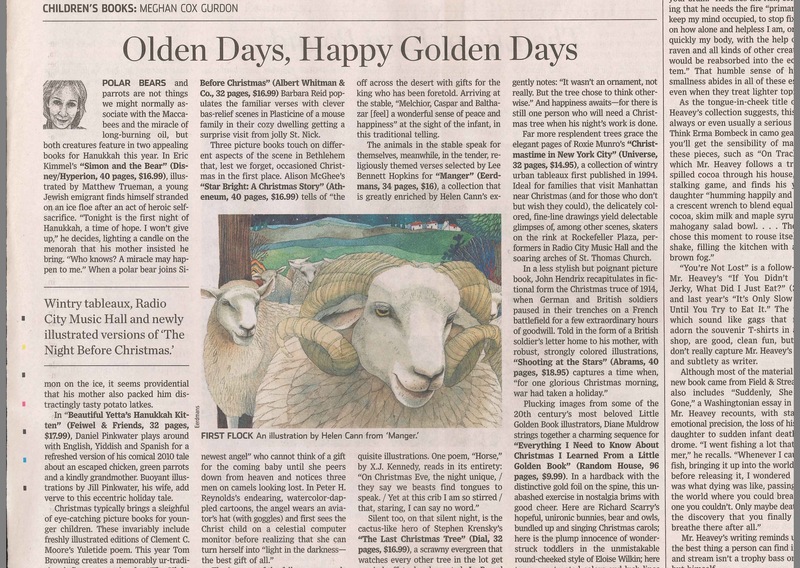 And what a lovely surprise to find one from The Wall Street Journal, not only with a picture but very complimentary too. Two years delayed and I hadn’t known about it until now. The same day, I heard news that one of my favourite map illustrators had agreed to feature in my map book. He knew of my work, liked it and had been using it as an example for his students at a prestigious New York art school. I hadn’t known about that until now either and was surprised and honoured. I suppose my point is that the invisible threads of communication are netted around the world very richly and you can’t always know who is watching or reading about your work. It’s a call to others and a reminder to myself to keep going when times are tough, when you believe no one is listening and you are simply shouting into the darkness. You just might be wrong.